Get ready, get set, SOAP! It’s time once again for a Bramble Berry Soap Swap! Our soap swaps are easy to participate in, and you may even meet a few fellow soapers or learn some new techniques yourself. Our last soap swap was a huge success, and we can’t wait to see what soapy surprises we get this year! Interested in swapping? Read on to find out how to get started! Anyone can participate in the swap, so if you’re a new soaper don’t worry. Our international friends can participate as well, but just expect to pay a bit more for shipping. Choose from our Bramble Berry fragrance oils and email us at Swap(at)brambleberry(dot)com telling us which ones you’re going to use. Also include whether you are going to make cold process or melt & pour soap. Whatever you send us you’ll get in return, so if you send us cold process, we will send you cold process soap in return. To ensure a good mix of fragrances, only 2 swap participants may use the same fragrance or essential oil per batch of soap. You’ll craft 12 bars of soap that are at least 4 oz. each. If you want, you can participate in both MP and CP swaps, just make sure they are “full batches” — twelve 4 oz. bars of each process. Don’t forget to label them with the ingredients you used and your company name or soaping alias. There is no charge to participate in the swap, but you do have to pay for shipping. To make things easy, all boxes will be shipped at a flat rate of $12.35. To pay, just add the Magical Swap Express item to your cart and checkout! Your swap items will not ship until we have received payment for your shipping. Once you pay for shipping, the rest is up to us! We will ship out your goodies by May 17. To make sure we have a good mix of fragrance examples, we will only allow 2 people to use the same fragrance. We will keep a list at the bottom of this post so you can check and see if your fragrance choice is still available. Fragrance and essential oils allowed will be first come, first serve, so be sure to email us ASAP! Please send 12 bars of soap that are at least 4 oz. each. It’s no fun to send full size bars and get teensy tiny ones in return. Please label your soap with the ingredients you used. Feel free to get crafty with your packaging too! Here are some examples from a past soap swap. Worried about your cold process soaps not curing in time? You can put use-by dates if you’re cutting it short! Ready to swap? Sign up here! If you have any questions, email us at swap (at) brambleberry (dot) com! Happy soaping! P.S. Like the color fade soap you see at the top of this post? 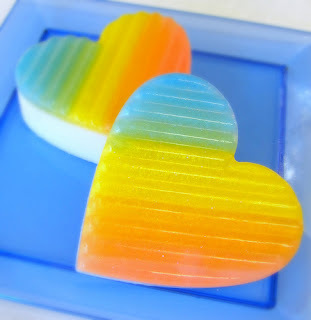 Check out our post about the SoapyLove 3 Color Fade to learn how to do it yourself! 1 Oatmeal, Milk and Honey Cybilla – Victoria C.
1 Blackberry Sage Cybilla – Jennifer H.
1 Ginger Lime – Debby L.
1 Cherry Blossom – Tanya R.
1 Energy – Scherry C.
1 Lilac – Catherine W.
1 Anise – Sarah T.
1 Oatmeal Stout – Heather C.
1 Wasabi – Jennifer R.
1 Yuzu – Kelly J. 1 Summer Fling – Nyota F.
1 Vanilla Oak – Michelle U. 1 Meyer Lemon – Ashley S.
1 Passionfruit Rose and 1 Kumquat/Fresh Mango Blend – Cassandra P.
1 Island Coconut – LeAnn N.
1 Vanilla Vanilla Cybilla – Christine K.
1 Crisp Apple Rose – Abby T.
1 Almond – Lori S.
1 Lemon Cake – Adrianna M.
1 Patchouli – Jamie C.
1 Lovespell – Alison D.
1 Grapefruit and Mint Essential Oil – Heather J. 1 English Rose – Erin C.
1 10x Orange, Bergamot EO and Patchouli EO – Dana W.
1 Blackberry Cybilla – Emily T.
1 Pineapple Cilantro – Melissa P.
1 Cranberry Pomegranate – Mary L.
1 Vetyver – Tami D.
1 Spellbound – Catherine W.
1 Fresh Zucchini Flower – Toni K.
1 Herbal Essence – Ann C.
1 Lavender Bouquet Cybilla and 1 Lavender Forest – Liz R.
1 Arabian Spice – Jeanette M.
1 Ginger Ale – Robert W.
Sweet Pea, Lavender & Chamomille Huggies and Bonsai – Toni B. 1 Lemongrass & Patchouli – Lisa H.
1 Energy & Lemon Verbena – Hilda B. 1 Rise and Shine – Marg P.
1 Lime & Mint – April B. 1 Dragon’s Blood – Jen F.
1 Nag Champa – Amy B. 1 Black Raspberry Vanilla – Heather F.
1 Chamomile Bergamot – Sharon H.
1 Lavender 40/42 – Gretchen O. 1 Blend of Ginger Ale, Champagne and Kumquat – Leslie I. 1 Pumpkin Lager – Richelle M.
1 Lavender – Audra W.
1 Soapy Clean – Nikki H.
1 Blend of Dark Rich Chocolate, Vanilla Bean and Coconut Cybilla – Kelly O. 1 Blue Man – Shalene M.
1 Black Tea and 1 Black Amber and Lavender – Kim G.
1 Sun Ripened Raspberry & Dark Rich Chocolate – Holly K.
1 Wake Up Rosemary – Kristie M.
1 Dark Rich Chocolate & Cream Cheese Frosting – Elizabeth M.
1 Pink Grapefruit – Christina M.
1 Baby Powder – Shannon M.
1 Chipotle Caramel – Melodie C.
1 Tangerine & Vanilla Select – Sarah B. 1 Dark Rich Chocolate & Chai Tea – Shawna F.
1 Relaxing – Michelle A. 1 Cherry Blossom – LuAnn R.
1 Spearmint Eucalyptus – Debra K.
1 Lavender Chamomile Huggies – Susan C.
1 Oatmeal, Milk & Honey and 1 Ginger – Wanda A. 1 Black Raspberry Vanilla & Champagne – Nancy R.
1 Rise & Shine – Dawnia R.
1 Apricot Freesia – Cathy J. 1 Lemon Poppy Seed & 1 Lavender and Orange – Francis S.
1 Fresh Linen and Lavender – Joy H.
1 Clementine Cupcake – Amy T.
1 Cedar and Saffron – Miranda B. 6 Bars Berrywine, 6 Bars Watermelon/Pearberry – Mary S.
1 Lavender 40/42 – Leilani O. 1 Energy & Sun Ripened Raspberry – Tanja K.
1 Tea Tree Oil & Rosemary – Erin R.
1 Moroccan Fig – Hayley M.
1 Black Raspberry Vanilla – Sabine M.
1 Spiced Mahogany (hot process) – Nikki W.
1 Raspberry Porter and 1 Baby’s Breath – Caron W.
1 Beau Brummel – Victoria S.
Eucalyptus Blossom and Peppermint – T.A. H.
Patchouli, pink grapefruit and tea tree oil – Karin M.
1 Pepperberry – Michele C.
1 Plumeria (hot process) – John D.
1 Crisp Apple Rose – Ariane A. 1 Passionfruit Rose – Aurora G.
1 Chipotle Caramel and Strawberry/Vanilla/Dark Rich Chocolate Blend – Rachel Y. 1 Ocean Rain – Rachel E.
1 Mint Chocolate Chip – Tricia R.
1 Amber – Kelli G.
1 Cherry Almond – Marilyn P.
1 Energy – Toni K.
1 Oatmeal, Milk & Honey – Ashley P.
1 Bay Rum – Elly I.
Almond Biscotti, Hyacinth, Feliz Navidad, Monkey Love – Jaslind G.
1 White Tea & Ginger – Kelly M.
1 Grapefruit Lily – Leah W.
1 Fresh Bamboo – Rosemary R.
1 Wasabi – Rosetta M.
1 Lemon and Lavender – Erin R.
1 Cherry Pop Lemon Drop – Carlee S.
1 Peach Champagne – Jamesha B.
Almond Biscotti, Chocolate Espresso, Exotic Fruit Smoothie & Toasted Rice – Karen H.
I love the idea of soapy swap, but I am only interested in CP/HP soaps made with all-natural ingredients. I would love to know how fellow soapers mix essential oils or use natural colorants, and will be very happy to share my 13 years of experiences. However products with fragrance oils and synthetic colorants would not help me at all. 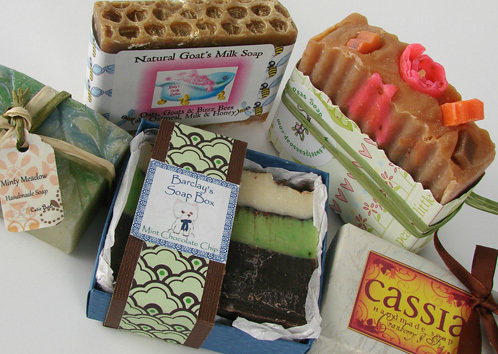 I know that there are lots and lots of soapers who make all-natural soaps. Would you consider having a separate All-Natural CP/HP category in your future soap swap? I think this is a great idea, thanks so much for your feedback! A natural soap category would be a lot of fun, and I’m sure a lot of other soapers would enjoy it as well. I will share this idea with the team. Thanks again for the input! Oh wow~I did not know about Brambleberry’s soap swap. I would love to participate next Soapy Swap! Please let me know by email regarding Brambleberry’s next soap swap!! Do you have next year’s soap swapping date? I am pretty pumped about my first soap swap everyone. The Plumeria turned out great! I do the hot process until I can really learn the cold. a lot of folks love my soap. I hope the 12 do too! Let me know if you got mine and what you think. If I could claim one of John’s soaps that would make my day, I love Plumeria! ^_^ I haven’t tried hot process yet, so it would be neat to see the difference. I’m so excited to receive the swapped soaps! One of the main benefits of doing Hot Process is that it helps speed saponification. It results in a unique, rustic looking bar of soap! This is my first soap swap and I am thrilled! I’m super excited for another swap! Just wondering if We can blend other fragrances along with the fragrances we are using from bramble berry? Or does our soap have to contain only bramble berry scents and no others? Great question! We would love to have you blend any of Bramble Berry’s fragrances together to create that perfect blend for your soap. Which ones do you plan on using? Can’t wait to hear more about your soap! I will be using a blend of 10x orange EO/patchoili EO/clary sage EO in a goat’s milk soap. I am thinking of doing a second set with another scent for this swap. But not sure what scent I will use for that yet. I’ve officially signed up for the swap! 🙂 What pushed me over the edge to participate? The fact that NO ONE is using a super (UBER) fantastic FO… and I’m on a MISSION to introduce it to more soap makers. I looked at the related Posts and viewed last years Soap Swap, which was announced a month earlier than this years. I would like to recommend you go back to that procedure, which gives people about 7 weeks to order the ingredients, wait for delivery, make the soap, let it cure, and still have time to ship it to you. I could only go with what I had in my stash, and of course I had just used the last of my Palm Oil making the Cube Swirl soaps the week before. I made some Palm Free today, which seized on me, so I may not have time to try another Palm Free & give it a couple weeks to cure before mailing out. And of course, I don’t have anymore of the FO I had used either. Why the rush? 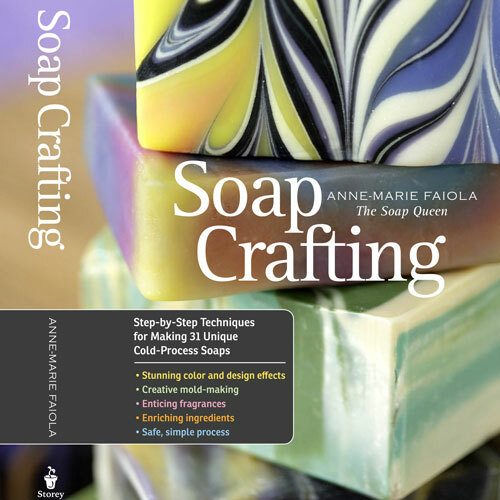 Or is the Soap Swap geared towards professionals that have a large inventory of soap supplies and soaps on hand? I know how frustrating it is when you recipe doesn’t turn out how you expected and it looks like Anne-Marie is working with you on the in the comments for the Palm Free Twist Tutorial. We definitely want to help you get to the bottom of this soapy frustration. Swap was first posted. Maybe the link wasn’t working. Can I join the swap? The little hamster in my head is running his tiny paws off to turn the rubber band connected to my brain. What can I come up with? Hmmmm. I better get a move on it! Can’t wait to check out all the other goodies! Sounds fun, I’m in! Thank you to all of our Bramble Berry friends for hosting this swap! Also, question: does hot process apply to the CP soaps as well? I can do cold, but hot process is a personal preference. Either works! Thanks! I just sent an email regarding sign up and selecting a FO and just realized I forgot to specify that I will be using Melt & Pour Soap. Could that be an international shippping issue as well? You can totally participate from Canada if you’d like! If you would like to do it, make sure to send us an e-mail at the above address and we will be able to give you a shipping quote as well. I just sent in the email typing it in (the old fashioned way, lol! )so hopefully that will be sufficient!